Add stunning metallic detailing to your craft projects with the brand new additions to the Spectrum Noir Metallic market range! These fabulous Antique Elements are dual-tipped and give a perfectly smooth and highly reflective finish. 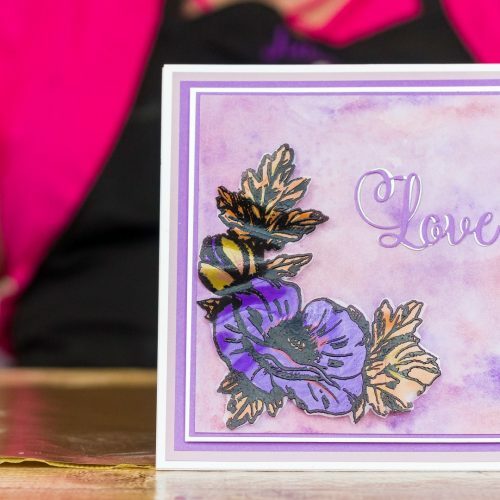 See how Julia uses hers on acetate to create a stunning card! Take Antique Pearl and Vintage Satin and scribble randomly onto your heat resistant mat then spritz with water. Place your Sheena Stamping Card onto the area picking up the ink, making sure to get it right to the edges. Dry with your heat tool. You can repeat this process if required. Take your acetate and run your anti-static pad over the top. Apply your Sheena stamp to the Rock a Block and ink with the Finesse Watermark ink pad. Stamp your image onto the acetate being careful not to slip. Sprinkle black embossing powder over the inked image and heat set. Place your image right side down and use your Spectrum Noir metallic pens to colour in. As you are colouring the wrong side of the image you only need to take care to keep your colouring within the very outer lines of the image. Cut roughly around the image. When the image is on the card you won’t be able to see your cut lines. Matt and layer your cardstock. Place sticky foam pads onto the reverse of your cut out image then attach to card. You can use the foam pads to create ‘folds’ in your image creating some depth. Embellish and stick on your sentiment.